Preheat oven to 375° F. Mix peanut butter cookie mix, vegetable oil, water and 1 egg together until soft dough forms. Roll dough into 48 (1 inch) balls and place on a baking sheet. Set sheet in the refrigerator while you complete the next steps. Mix one sugar cookie mix, 1 softened stick of butter, 2 tablespoons of flour and 1 egg together until soft dough forms. Gather dough into a large ball and set aside. Repeat with second sugar cookie mix, 1 softened stick of butter, 2 tablespoons of flour and 1 egg to make second batch of sugar cookie dough. Knead both balls of dough together, then split into 5 smaller balls. Starting with the first sugar cookie dough ball, add a few drops of the first food coloring and knead to incorporate the color throughout. Continue adding a few drops of coloring, kneading well after each addition, until you get the color intensity you want. 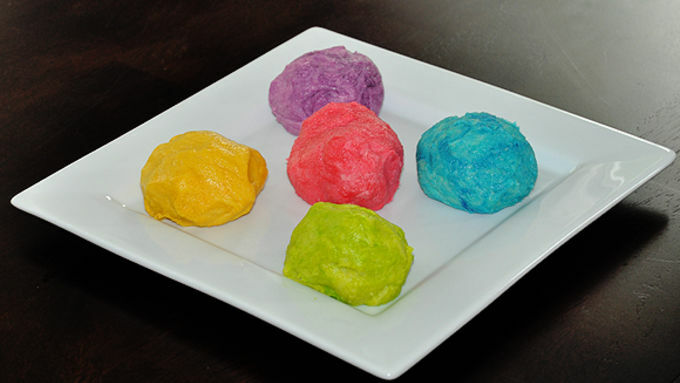 Set aside, wash hands (to avoid color transfer), and continue with remaining 4 colors until you have 5 colored balls of dough, one in each desired color. Remove the peanut-butter balls from the fridge. Starting with the first colored ball of sugar cookie dough, pinch off a small portion and push into palm of hand to make a 2 inch circle. Add one peanut-butter ball to center, wrap colored dough around the peanut-butter ball, and roll ball until smooth and uniformly shaped. 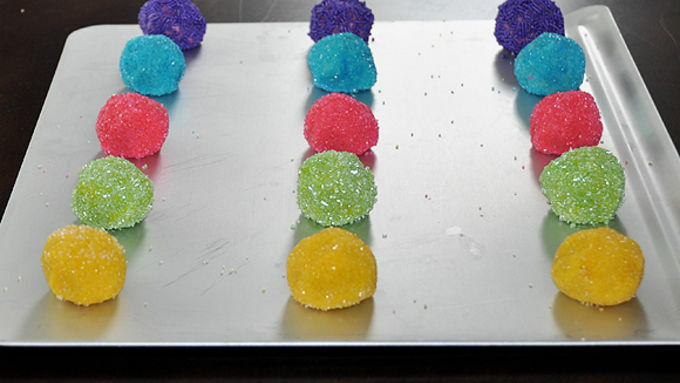 Roll in colored sugar or sprinkles as desired and set on an ungreased cookie sheet. Repeat, placing 12 balls about 2 inch apart. 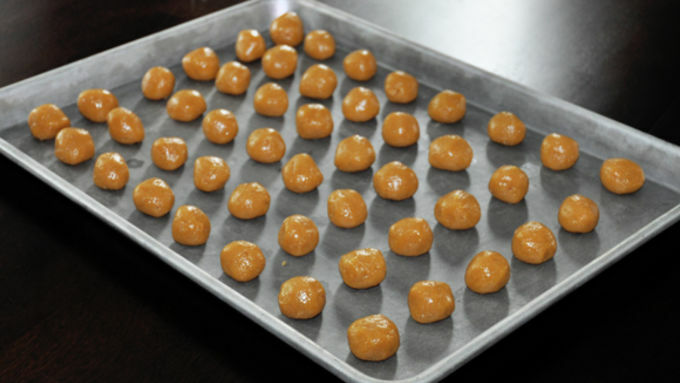 Continue until all peanut butter balls are wrapped in colored dough. Bake one cookie sheet at a time for 8 to 9 minutes until cookies are set but not brown. Remove sheet from oven and LIGHTLY tap tops to remove any remaining mounds so cookies are flat on top. Allow cookies to cool on sheet for 2 minutes, then remove to a cooling rack to cool completely. Repeat with remaining cookies until all are baked. Cool: Pot of gold under the rainbow. 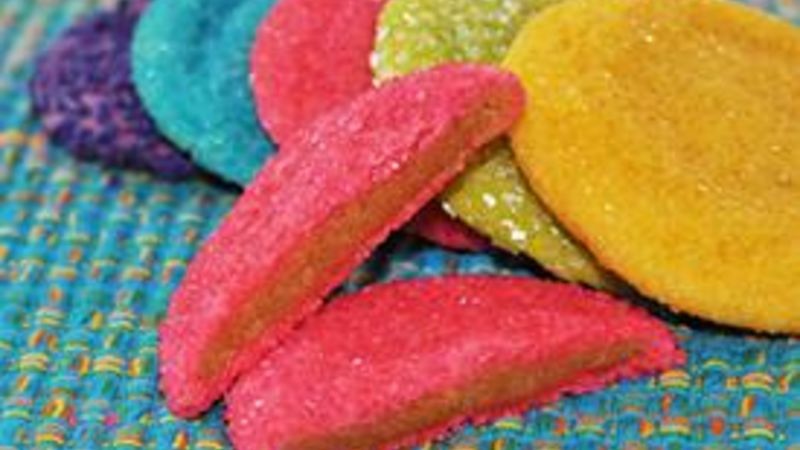 Cooler: Pockets of golden peanut butter inside rainbow sugar cookies! 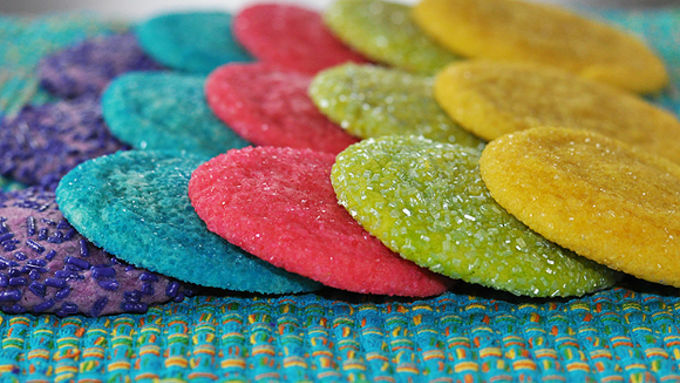 You're gonna schlep these Peanut-Butter Filled Rainbow Sugar Cookies to absolutely every party you go to from now on. But how can you possibly make them, you crazy-busy person, you? After all, you've got people to see, stuff to do and places to go. We hear ya. But this is soooooo fuuuun. And because it's basically like playing with Play Dough, you'll get a whole therapist's session worth of de-stressing (not DIStressing!) when you make 'em, too. I'm taking you by the arm right now and coaxing you to check this out ... don't make me grab you by the ear lobe. And then, my friends, you're so ready to rainbow rock! Just think: Kid lunchboxes Parties Care packages to soldiers or college students Gift packs for new moms Holidays, birthday parties or gal-pal weekends Team banquets (in team colors, der!) For the office, 'cuz you want that promotion! For any reason at all Finally -- a fun, fab treat that matches your bright, sparkling, colorful, life-of-the-party personality!